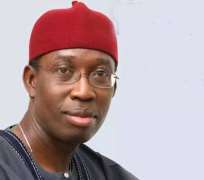 If the Youth Agricultural Entrepreneurs Programme (YAGEP), is what the Senator (Dr) Ifeanyi Arthur Okowa-led administration in Delta State termed as its mega project, then the programme may have suffered setbacks as the present trainees laments the challenges facing them. A section of the 24 youths who are currently engaged in Isiagu, Aniocha South local government area of the state in a tomato cluster, revealed that they have challenges water, transportation and currently do not have a place to rest from the scorching sun and when it rains. The YAGEPrenures spoke exclusively with Hardreporters correspondent when the governor inspected the farm cluster on Tuesday 23rd May, 2017 to mark his two years in office. According to them, the only borehole in the farm could not supply the entire farm water, leaving the tomato to suffer acute water supply even as they noted that they come from Asaba, to work on the farm. It was observed that another borehole which was been manually dung, sunk, leaving the YAGEPrenures to battle with only one borehole while those who could not wait are engaged in manual watering. One of the YAGEPrenuers, Peter Mbeze, who conducted the governor round the farm also lamented to the governor that the issue of their transportation and stores should be looked into. The over N1 million farm in terms of profit may not yield its desired goals following the poor irrigation system adopted by the state government as the trainees are not only involved in a particular type of crop but are engaged in rotation farming. In his response, the governor frowned at the situation, particularly the water challenges and called on the Chief Job Creation Officer, Prof Eric Eboh to move faster than expected.